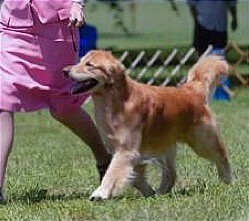 Skye was an outstanding representation of the breed, which he proved by becoming the first CH ptd. OTCH MH VCX. He had a superb temperament and got along very well with children, old folks, puppies and other dogs. He was always confident in new situations-always awaiting the next adventure! He was a fast, agile and stylish worker. 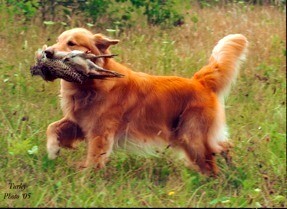 He had strong marking ability and was a superb handling dog. He had a strong work ethic and willingness to please. He loved to work no matter what the venue! Skye was a well-built dog, which was evident by his winning two National Specialty conformation classes in his career (Novice Dog 2003 and Hunting Retriever Dog at Kansas City) as well earning WD in Indianapolis. He was moderately built with a very solid top line and a powerful rear. His eyes told of his intelligence and willingness to please. He was balanced from front to rear, had full dentition with a correct scissor bite. He had correct coat, medium gold in color with nice feathering. At his prime, he weighed 65 pounds and was 23” tall. Skye’s pedigree is a combination of high level working titles and conformation Champions. He carried on the tradition! Skye is passing on his intelligence, good looks and temperament to his puppies. 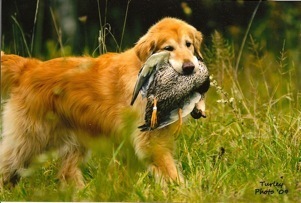 2006: Skye wins the Hunting Retriever class at the National Specialty and makes the first cut in BOB at the young age of 9 ½! 2005: Skye made the cut in the large Am Bred class and placed 2nd in the Hunting Retriever class as well as earning a UDX leg. 2004: Skye makes breed history by becoming the first CH ptd. 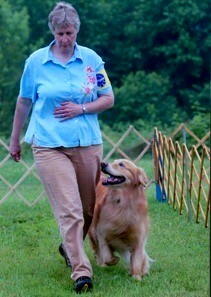 OTCH/MH after winning the Open Dog class at the Lebanon, Indiana shows. He also took Best of Winners and earned his VCX! 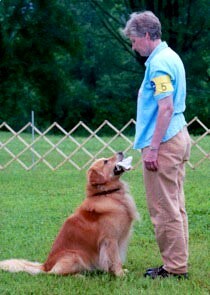 2003: Skye earned his Obedience Trial Championship (OTCH). He earned several HIT and HC along the way. 2003: CVGRC National Specialty: Skye wins the Novice Dog class and was awarded the Troy Trophy for the highest scoring obedience dog who was also showing in breed. He finished his NA title with a first place, shortly after his win in conformation. Also in 2003, he earned his UKC-UD and NAJ title. 2002: Skye earned his Master Hunter title (MH) in June, his WCX title in July and his UDX in August with two HC and a HIT! 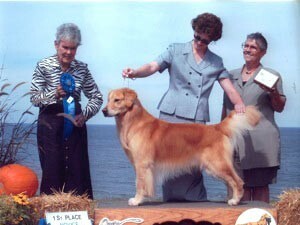 2001:Skye earns the CVGRC Altair Award for highest average scoring obedience dog in 2001. 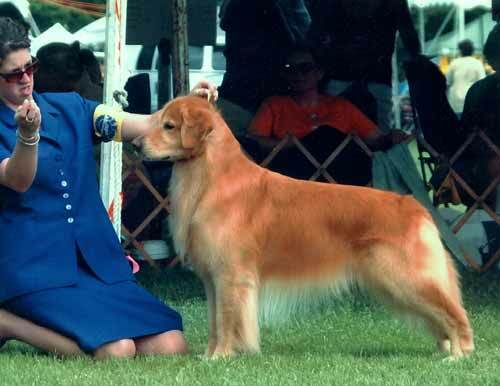 2000: St. Louis National Specialty: Skye won the Graduate Novice class; took 1st in Open A and was the highest scoring dog with a hunting title. Click here to see some of Skye talented offspring! Click on Skye’s photo to see his accomplishments. Skye took first place and finished his NA at the 2003 NS. He posted the fastest Novice Standard time of any jump height. He also placed 3rd in the Novice Jumpers 24” class and then finished his title that fall at the Cleveland IX center. I decided not to go any further with him in agility, though I know he could have gone to whatever level I would have wanted him to achieve. 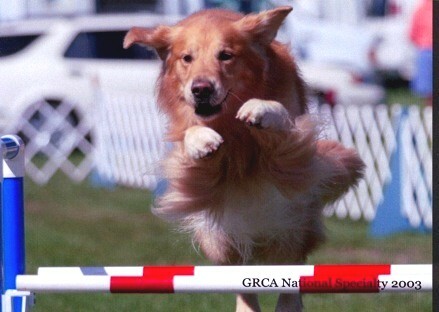 Unfortunately, I only have one picture of him doing agility but it is a great one!